Kyrie Irving was the true hero in the Celtics 114-112 victory over the Indiana Pacers with his razzle-dazzle dribbling and late-game layup. But Aron Baynes played a whopping (for him) 32 minutes and made the most of them. His 13-and-13 points-rebounds, double-double was critical. He shot 6-of-10 on field goals and also made his sole 3-point attempt. Baynes is making a case for remaining in the starting lineup over former starter, Marcus Morris. Morris scored seven points last night on 3-of-8 from the field and 1-of-5 on 3-pointers while handing out zero assists. One of Aron's biggest assets is - well - his size (and strength). Watch the video below where Baynes-ey sets an unmovable screen for the now-retired Manu Ginobili, then gets to the hoop, takes the pass and jams it in. Manu Ginobili shared his own practice lowlight involving the dude Spurs play-by-play man Bill Land calls "The Big Banger," saying "I remember one time I tried to take a charge (against Baynes) and it was the worst idea I had the last 12 years, so it's not happening again anytime soon." Celtics opponents used to think twice about driving to the hoop against Bill Russell because of Bill's shot-blocking ability. Present Boston foes aren't thrilled about going into the paint against Baynes-ey because he is such an imposing presence. The present starting five may not be the best offensive quintet the Celtics have, but it just may be the top defensive unit. With Marcus Smart (he is so vital to the cause) directing the defense anywhere on the court it is needed, Al Horford and The Big Banger handle things close to the hoop. It is working so far. Celtics' defensive rating when Aron Baynes and Al Horford were on the court together Friday: 90.7. That's 16.4 points better than their season average. 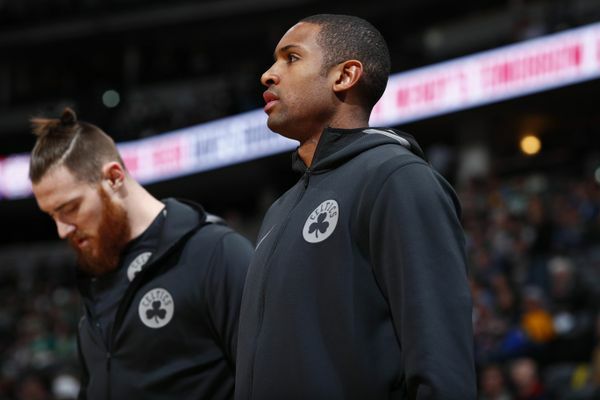 For the season, the Baynes/Horford combo has a defensive rating of 85.0 in 115 minutes.